This months pack saw our first discrepancy between the listed items and the packed items. 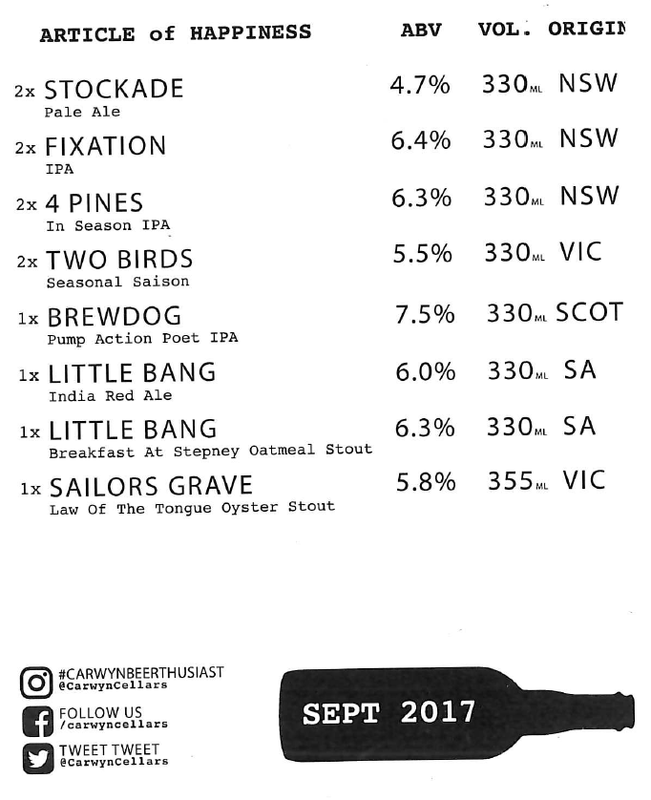 We received two of the Little Bang India Red Ales instead of one, and none of the Little Bang Breakfast at Stepney. 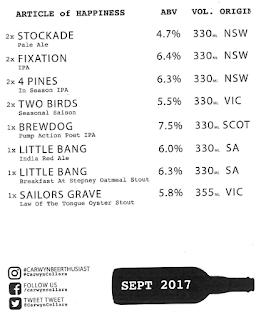 That error aside, we saw a lot of hops in this pack as well as some interesting new Victorian singles from Two Birds and Sailors Grave. I've said this many times recently, but Stockade make a number of really solid offerings that are true to style. Chop Shop is no exception, it's lovely earthy Pale Ale which is a bit different to a lot of others on the market. Plus it's got really nice label artwork. "This is an intriguing little pale, with slightly more malt character and hops that lean towards the earthy and floral rather than big fruit/pine. It’s not everyday you have an Australian pale with Fuggles as one of the stars! It’s a nice pale at under 5% ABV, packing plenty of flavour in. Your mileage may vary in terms of how much it works for you but you’ve got to appreciate them trying something a bit different." I've been a massive fan of the eponymous IPA from Fixation Brewery since I had my first one in mid-2016. The brewery was founded by Melbourne beer identity Tom Delmont, with the sole purpose of producing IPA's and boy they can do that. The brewery is opening a brewpub in Collingwood next year, which is a venue that I may never leave! 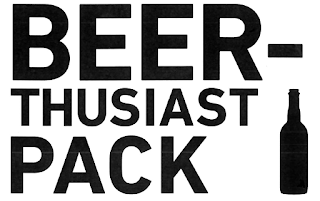 "This is another really good IPA that I’m sure everyone has had more than a few of by now. When fresh it’s the easiest IPA around to recommend, with one foot in the slightly old school West Coast IPAs and one foot in the new world. It’s wonderfully balanced, firm and punchy with what is now a pretty classic IPA hop combo (Mosaic, Simcoe, Amarillo, Citra). It’s not as finely tuned to personal taste to be one of my favourites, but it remains objectively one of the best in Australia." I would be one to argue that objective Dylan; it's definitely one of Australia's best IPA's, certainly the most consistent at least. Say what you will about 4 Pines and their ownership status, but they still produce damn good beer from time to time (particularly their Keller Door releases). This In Season IPA changes everytime they brew it depending on what hops are available, in a similar vein to the Luponic Distortion range from Firestone Walker. "Number 5 is out now, which I suppose is evidence of us being a little behind on these Carwyn packs. Even if it was the tail end of number 4’s run I still found this very enjoyable, a great example of a sturdy IPA that doesn’t shy away from big hop character and bitterness. A bit of fruit, a bit of pine, all good stuff. I love the concept too." I really like what Two Birds are doing with their seasonal releases; Saison fits the bill for Spring perfectly! Having had an earlier version of this beer previously, I'm glad that they've been tweaking it. It's still on the entry level side of Saison, but the bones are there. A bit more yeast character and this could be quite an impressive beer. "I had this at the brewery a few months back now. I remember being thoroughly unimpressed, with little saison-wise present in terms of yeast and a dry finish. This one is still far from a traditional saison but a big step in that direction, with an intriguing herbal/citrusy hop mix and some sweet, yeasty funk. The sweetness was actually my least favourite thing about it - if it finished drier it’d be a very good beer. As it is it’s enjoyable enough, just don’t expect your usual saison." Pump Action Poet is one of the beers from the small-batch series produced by BrewDog. The small-batch series gives the brewers the chance to experiment and explore different techniques. This particular IPA had a heap of peaches and apricot added to it alongside the hops. "Somehow this doesn’t have Mosaic in it! It’s somewhat of a testament to the wonderful flavours of that hop that it takes an actual addition of peaches and apricots to emulate the flavour of it alongside more regular IPA hops. That’s what BrewDog have done here, with the aforementioned fruit lifted up by Simcoe, Citra and Amarillo hops. It’s a tasty and supremely drinkable IPA, with the stonefruit lending it a certain juiciness along with waves of dried apricot flavour and zesty, yet fairly gentle, bitterness." This beer was dangerously easy to drink considering the hefty 7.5% ABV. I had quite a few of these and was impressed at how long the stonefruit flavours hung around - much longer than if it was just hopped. "Really enjoyable red. Big whack of hops with a lightish body that has notes of caramel and toffee. 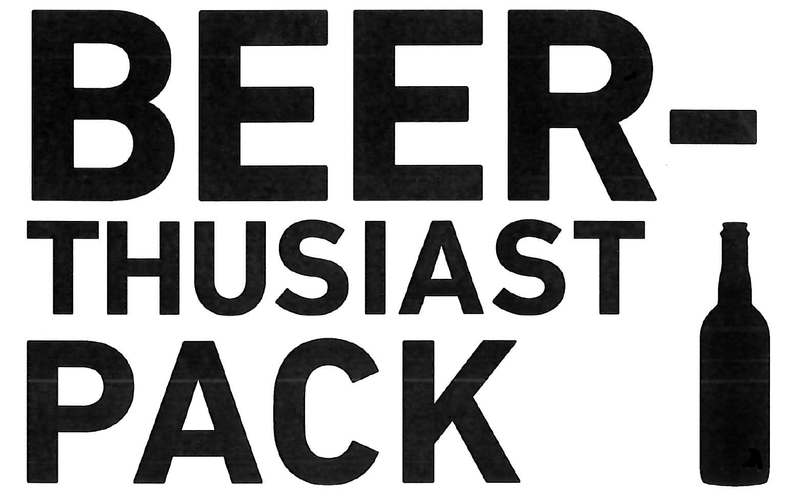 It all works well together and is definitely a beer I’d revisit in future." Despite the interesting style description, I think this is a really well balanced India Red Ale - or Red IPA if you prefer. There was a bit more to the malt than many other examples, which could be where they are getting their "pseudo-Scotch Ale" bit from. An Oyster Stout is exactly what is sounds like, a Stout brewed with Oysters. The history of the style is vague at best, with debate ranging from oysters initially being used as a finings agent to it being a myth that spawned the style. In any case, I'm quite interested to taste Sailors Grave's take on this style. "It’s somewhat sacrilegious to say given how much of an old tradition it is but I always found oyster stouts to be quite a silly concept. Silly describes a lot of the more enjoyable (and less enjoyable for that matter) craft beer trends, but I’ve never had an oyster stout that made me go “yeah, I get why they do this”. There’s really light salinity here but to be honest it’s 95% a bog standard porter - nice and creamy mouthfeel, touch of smoke, but nothing else worth noting. Pretty enjoyable but falls a little short." Due to my moving and foot operation we are a very long way behind on the reviewing front at Beer O'Clock Australia HQ. The review of October's Pack will hopefully be up by Christmas, with November and December to follow in the New Year. I'm completely u to date on emails, they were a good way to procrastinate whilst not doing that enormous Untappd Catchup, so keep them coming!